I know it probably isn't new to anyone but me, but I am completely amused with it! I had all of her cloth diapers in the dryer, so I took one of her flannelette receiving blankets and fashioned it into a diaper. Made a very pretty diaper too! 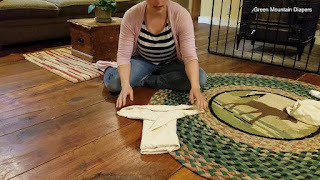 The Jo Fold - How to Fold a Flat Diaper from Green Mountain Diapers on Vimeo.